Humans are an aberration in the animal kingdom. In most species, the male is the more colorful, using hues, plumage and song to woo the females. But among humans, it's the women who use color and designs to catch their prey. The Trimmed Chemise is, quite possibly, evidence of natural selection. Women's chemises gradually became fancier and fancier in an attempt to outshine their female competitors. So it's was a rather predictable development when silver and gold trim were used on the sleeves of their chemises. What couldn't be predicted was how beautiful the chemises looked with the added flourish. 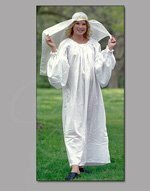 The trimmed chemise is similar to our Traditional Chemise, but it features decorative Celtic-knot trim that scrolls down both arms. The trim, available in either silver or gold, distinguishes this chemise from all others and actually complements most outer garments that are worn with it. The chemise is worn under outfits like a medieval slip. They absorb any perspiration or assorted body soils and protect the outer garment from wear and tear. Our chemises are made from the same soft cotton muslin used to back baby quilts. 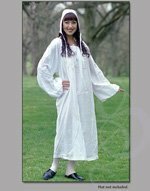 They come with drawstring necklines and have very long sleeves for that extra touch of elegance. They are machine washable. One size fits all.